There are many obstacles to be faced and overcome in agricultural work. Countless difficulties in the period between planting and harvesting invite failure and discouragement, but there are several resources available in nature itself to achieve success. He who plants does not always get to experience the harvest, even though, quite understandably, planters enjoy the success of harvesting. This is a reality that we often experience in the mission fields. Jesus forewarned us about this. He said: “And he who reaps receives wages, and gathers fruit for eternal life, that both he who sows and he who reaps may rejoice together.” John 4:36. This story begins with a man that I studied with when I first began as a Bible worker. His name is Pastor Elias and he was an evangelical minister. After much prayer and several Bible studies, I was thrilled when he chose to become a Seventh-day Adventist. His entire family was baptized with him and my heart couldn’t help but sing for joy that I was having the privilege of seeing the crop. Pastor Elias was, and is, director of a rehabilitation center for drug addicts. He has been actively sharing the great Three Angels’ Messages with his guests ever since he accepted these messages himself. Just a few Sabbaths ago, five of these precious souls surrendered their hearts and were baptized. Among them stood a woman of only twenty-one years of age, named Katia. Let me tell you about her. Katia’s sad story, of what seems like endless problems, began shortly after her birth. Her mother decided that she did not want her, so when just a newborn, Katia was abandoned in the city of Rio de Janeiro. Her uncle felt very sorry when he found out about the situation, so he decided that he would take care of her. He raised her like his very own daughter until she was 11. At that time, Katia decided that she wanted to have a relationship with her biological mother and moved in with her. Sadly, her mother was not a very good influence, or let me just say, she was a very bad influence. At that very tender age, the mother introduced Katia to alcohol—telling her that it would help her to enjoy life much more, despite the problems around her. Katia didn’t last long with her mother, so at age 15, she left and moved in with an aunt, who lived in the state of Minas Gerais. That was an even shorter-lived relationship. Katia was only able to stay there for five months because her cousins were drug users and she was abused and physically assaulted. That was it for Katia, and she decided the safest place to be would be the street. Unfortunately, the trade that Katia picked up to pay for food and clothing was not a reputable trade for any woman. She found customers of all types who would pay her for her “services” with clothing, food, alcohol, or drugs. Her life was just going from bad to worse. Now homeless and sleeping in the woods or right on the street, she just roamed around aimlessly during most of the day. She would go for months without having access to a shower or a way to change her clothes. She didn’t know how to get out of her situation and just resigned herself to the idea that this is how she would live for the rest of her life. Finally at age 18, Katia decided to see if she could return to her uncle. But when the uncle saw that she could fend for herself on the streets, he sent her right back out the door. Eventually, Katia found herself pregnant—seven months pregnant before she even had it figured out. She was broken. She had a dream of raising a family in a normal environment. She wanted her children to have a good father. “Now what am I to do?” she wondered. Katia (center), flanked by Clayton and Priscilla Silva. About this time, one of Katia’s cousins referred her to a rehab center in the area. The pastor that was running that rehab center took pity on her and said that he would help her with her soon-to-be born child. He offered to register her child in his name as the father. Katia was quite please with the arrangement, even though she didn’t understand how the child could be registered to her as the mother and to a married man as the father. When the time came to process the papers, the pastor took his own daughter to the government office, on behalf of Katia, because Katia didn’t have valid paperwork herself. He then registered himself and his wife as the adopting parents. Once all was in order, he informed Katia that the baby was no longer hers and that she would no longer be allowed to even visit the child. Katia was furious. For three years she tried to regain custody of her child, but to no avail. This deceitful crime left her deeply shaken. She eventually gave up and returned to the streets and the life she had lived before. Her face began to just emanate the bitterness that had taken hold of her heart. Now it seemed her life was going from worse to beyond imagination. Then one day her cousin found her again and told her about another treatment center. He told her that this treatment center would change her life—that it was her only hope for getting out of the rut that she was in. Katia was, understandably, resistant to trying another treatment facility, but eventually she decided to give it a try. The pastor and his wife took her under their wings. They began showering her with affection, kindness, and love. Katia really did appreciate the kind treatment, but unfortunately her pull to the “old life” was strong too, so she would come and go. She would stay at the rehab facility for six months or so and then she would be gone—living her life on the streets. Then she would return after things got too desperate. One day things got really desperate. Because Katia had returned to the streets during frigid weather, she had contracted tuberculosis and was very sick. And to top it off, she was pregnant again. She was in the most dreadful situation yet. This time she remembered how kind Pastor Elias and his wife had been to her—how they had showered her with love and affection. She came to herself and, like the prodigal son, she decided to return and get the help she needed—and stay for good this time. Pastor Elias readily welcomed her back and this time Katia requested Bible studies. 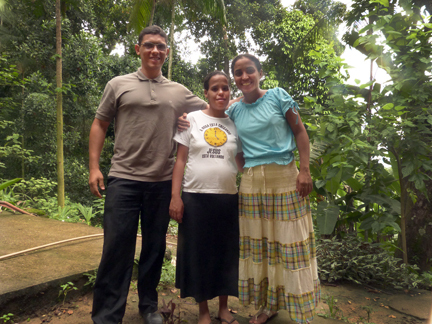 Pastor Elias taught her how to pray and study the Bible. He taught her to love her Savior with all her heart. What a glorious Sabbath it was when everyone saw her publically claim Jesus as her own personal Savior and be buried in the baptismal waters! Due to the experiences that poor Katia had suffered in her young life, it seemed that she should spend the rest of her life engulfed in bitterness, except that, by the grace of God, the gospel seed has found way into her heart. She is now a happy young Christian that is just bubbling with the love of Jesus. It is such an incredible privilege when we get to have a little taste of the harvest. We can only guess what heaven sounded like when that angelic choir unleashed their joy over this priceless repentant sinner—Katia. Today she is working for the rehab facility, helping other forlorn young women overcome their addictions and start a new life. She is engaged to a very upstanding young man who has also agreed to adopt her new son. I can’t help but praise God every time I see the new Katia. Praise the Lord! By Clayton Silva, a full-time Bible worker for First Fruits ministry. Email: clayton.1978@hotmail.com.